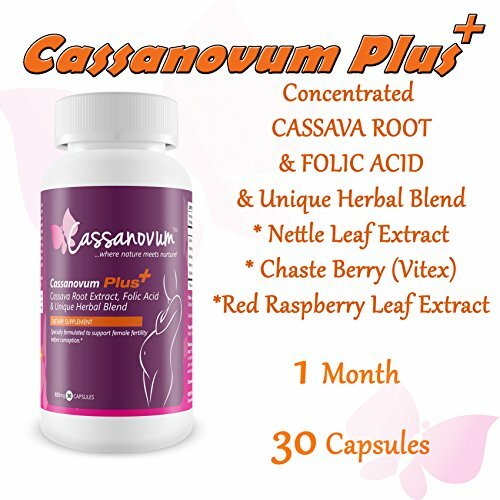 Full of GENUINE Cassava Root mother nature properties to boost fertility. 100% Natural ingredients. Contains natural hormone Phytoestrogen which controls the female menstrual cycle and can trigger hyper-ovulation where more than one ovum is prepared and released in readiness for fertilisation during a single monthly cycle. Normally only one is released. Unique Market Leading mix with Folic Acid to prepare your body for pregnancy. Contains multiple vitamins that include, amongst others, C, B-6, Folate, Thiamin and Niacin. Contains multiple minerals that include, amongst others, Potassium, Phosphorous and Magnesium. Hermetically sealed to protect against environmental contamination (until opened). Manufacturer Tested to guarantee ISO9001:2000 MHRA International Standards. Fortified with Folic Acid to help develop your Baby. Easy swallow capsules. Professionally manufactured with state-of-the-art clinical production methods. The manufacturer is US FDA and US EPA registered. • Red Raspberry leaf (Rubus idaeus): Raspberry leaf works to tone the uterine muscles and normalize blood flow during menses. This is one of the best normalizing herbs for the female reproductive organs. Raspberry leaf is astringent, contracting and shrinking internal and external body tissues. May help prevent haemorrhage excessive bleeding. Helps to reduce bleeding of endometrial tissues. • Nettle Leaf Extract tones and nourishes the uterus, it also promotes strengthening of the kidneys and adrenal glands. It is loaded with chlorophyll (a detoxifier) and goes a long way toward preparing a woman’s body for pregnancy and for sustaining the embryo once conception occurs. Supports healthy iron levels, which is important for conditions where internal and/or excessive menstrual bleeding is taking place. Aids proper liver function for hormone balance support. • Vitex Agnus Castus Vitex has been shown in several clinical studies to help stimulate and stabilize the reproductive hormones involved in ovulation, cycle balance, and menstrual regularity. To understand how vitex works, let’s first look at female fertility. In order for conception to take place, a woman must have a regular menstrual cycle and ovulate (release an egg from an ovary). Hormonal balance is key to regular ovulation – particularly the ebb and flow of the reproductive hormones estrogen and progesterone, which both prepare the body for ovulation (estrogen) and ensure that a pregnancy, once achieved, is maintained (progesterone). Regularity of both menstrual cycle and ovulatory function, dictated by the complex play of these hormones, are key factors in successfully becoming pregnant. Vitex increases fertility by helping regulate hormonal and menstrual balance.